This breezy mystery is a novella, approx. 20,000 words. It also includes two short stories by the authors, both from the acclaimed crime fiction anthology, Chicago Blues. The narrator Mary Conway is new to me, it took me a little bit to get used to her voice it sounds a bit young yet has a roughness so for me it took a little to get used to, but by the end I was happy with her narration and would listen to others narrated by her. Chicago Blues short story My Sweet Man &another story I didn’t catch the name of by, Libby Hellman and David J. Walker narrated by, James Lewis, both were way more gritty stories than the first one. The last story is extremely gritty and has a lot of language it was quite a departure from the first story being more of a cozy and the second one was more family secret type mystery, they seemed an odd pairing on the same audiobook. I enjoyed My Sweet Man but I think it would have been better without the final story. The narrator James Lewis has a husky deep voice that I like, his voice is good for gritty mystery or noir would fit his voice well too. I would listen to more from this narrator. All in all this short 3 hour audiobook is pretty good I really liked the first story, the second one was also good but the last one just didn’t do it for me. I would have rated this 4 stars if it had only been the first & second story but the third story brings it down to a three but will end up with 3 ½ stars for good narration. Would read more from this author and listen again to these narrators. I received this from the Audiobookjukebox and the author/publisher Fischer Hellmann Communications for a fair and honest review. The novella The Last Page is a charming, light mystery set in a library and revolving around the death of an unlikeable head librarian. The young heroine, Julia, will appeal to cozy readers as a smart, likable sleuth who is dogged and crafty in ferreting out the truth, and both librarians and readers who consider the library a second home will get a kick out of the story and characters. The two short stories included by the authors to round out the recording are much darker in tone and more representative of the writers' usual styles. I would recommend letting a day or two pass after finishing The Last Page before moving on to the short stories. 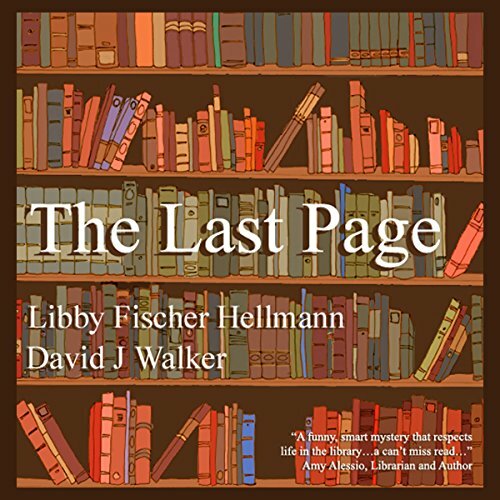 Libby Fischer Hellman and David J. Walker have written entertaining and suspenseful stories in this anthology. The narration by Mary Conway definitely added to my enjoyment. I was drawn to Julia in The Last Page. She is an intelligent woman who follows her instincts. I always read Nancy Drew as a child and this character made me feel that this is how Nancy would be all grown up. The library is the perfect setting for hidden secrets. The story was well plotted and filled with interesting suspects and motives. I enjoyed the Last Page and the other short stories included. This review was originally posted on my blog, Exploring All Genres. This audiobook starts off interestingly enough. You’re introduced to the victim, Barbara Adams, and what happens to her before she dies. It certainly makes you wonder why she was killed. I would like to say that the narrator did a very good job on this one, she made sure each character had a distinctive voice something I think is extremely important in audiobooks, and that the tone/pitch of her voice reflected what was going on in a particular scene. Now there were a few spots where the narration got a little bit dull, though that was likely more a lull in the story that anything to do with the narrator but I did need to truly concentrate on what was being said at that time to absorb it. The banter between Mavis, Barbara’s best friend, and her daughter Julia, as they talked about various things including Barbara’s death was a bit boring. I realize it’s a necessarily evil to give some background and introduce the other characters but I really had to focus on listening to what was being said and not staring off at the wall ignoring them. I found it all too convenient that Julia was in school for Law and obsessed with mystery books so of course the allure of investigating her mothers friend was just too much for her to resist. And the fact that she hid her initial investigation by telling the temporary library director that she was writing a book about library works and Barbara Adams also seemed all too convenient. As things progress you find out more about the victim as well as her background and are introduced to a number of characters as well. Barbara was clearly not the most liked person out there and so the suspects of who would want to kill her/could have killed her were long enough and the reasons varied quite a bit. Pretty good amount of mystery and suspense, especially towards the end. While there were two additional short stories included with this audiobook I did not find them to be of interest to me, more so since they had no connection to the main story. Overall this was a very quick mystery read, the audio from this part being about an hour long. I thought the story had good potential but it might have been better had it been a bit longer and the few things that seemed to be put in place strictly to make the book faster, like Julia being in law, been changed. Fans of cozy mysteries and quick reads will likely enjoy this book.